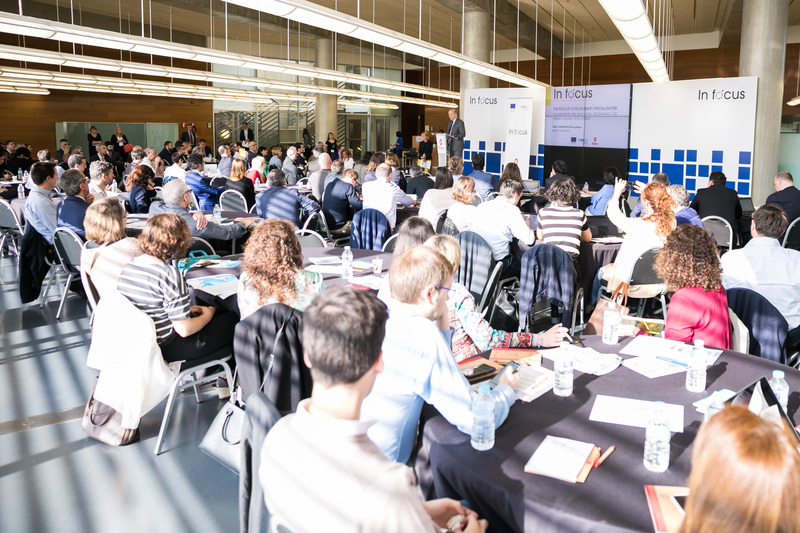 The URBACT IN FOCUS Final Conference took take place on April 19, 2018 in Bilbao. 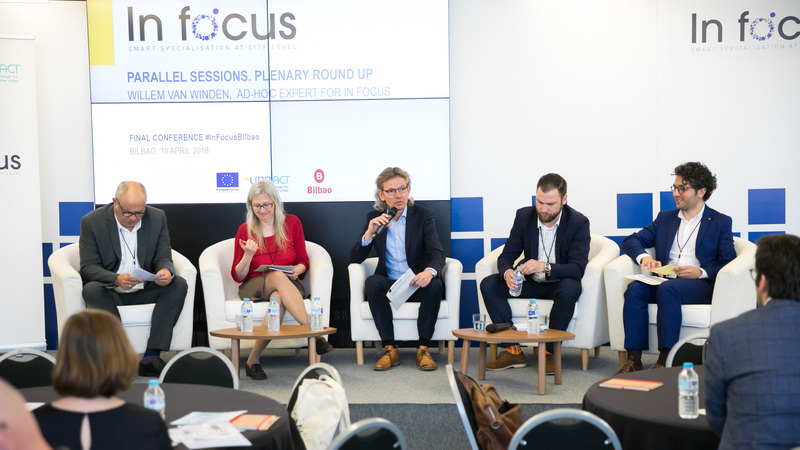 This event was the perfect framework for celebrating the results of the IN FOCUS project, in which 10 European cities have worked as a network over 30 months for the promotion of local economic development from smart specialisation and city-region articulation in RIS3. This interesting and fruitful final conference has served to share the new knowledge accumulated along the past 30 months of peer-learning. It has also been a new opportunity for discussing and getting new ideas and viewpoints by bringing together practitioners, elected representatives and main stakeholders in the field of urban economic development. The final conference of the IN FOCUS project which, under the title “The role of cities in smart specialisation: Collaborative and multi-level governance for urban economic development”, took place take place in April in Bilbao, was chaired by the Mayor of Bilbao, Juan Mari Aburto. The conference counted also on the presence of the Mayors of Bordeaux, Ostrava and Plasencia, who showed the commitment of their cities to promote new dynamics around innovation and attractiveness by refining their current policy-mix on economic development at the light of the smart specialisation approach. Furthermore, Professor Kevin Morgan at Cardiff School of City and Regional Planning and member of the RIS3 mirror group, explained how cities, regions and municipalities can act as living labs and urban innovation platforms where RIS3 projects are piloted and scaled up. But, building local innovation ecosystems requires time, trust and collaborative place-based leadership. Vertical policy networks - from Brussels to cities, regions, provincial councils and municipalities, but also horizontal policy integration are crucial. As he said, a shared destiny is the key. In this sense, in the conference we were able to learn how the 10 partner cities of IN FOCUS have made a shared journey, the IN FOCUS Journey. On this journey, URBACT has provided all the IN FOCUS cities a framework to encourage the reflection upon the role of cities as drivers for change. As the Lead Expert for IN FOCUS, Miguel Rivas, stressed, tackling the issue of a more effective city-to-region articulation with regard to smart specialisation, will raise the status of local and metropolitan authorities as innovation and industrial policy-makers, which makes full sense giving the main role major cities play in today´s global competition. Besides, we also had the opportunity to learn more about this Journey by the actors involved. In this sense, the IN FOCUS partner cities shared with all the attendees the lessons learnt in a joint work plan that included five international thematic workshops plus a formal peer-review exercise. Such a large-scale peer-learning has mobilised over 200 key stakeholders and crystallised in the production of an Integrated Action Plan in each of the participating cities. Finally, a panel discussion, moderated by the URBACT Programme Expert, Sally Kneeshaw, showed how regional and local authorities, and specifically, Bilbao and the Basque Country, are talking together about the multi-level governance on the implementation of smart specialisation strategies. Above all, the Bilbao conference should not be seen as an end. On the contrary, it marks a path to walk on. Not only for the 10 cities involved, but for other cities as well as the teams more closely involved in the delivery and implementation of S3. This is not the end of the journey; it’s only the beginning of a new chapter. We will continue the IN FOCUS journey to consolidate the role of cities in the smart specialisation. Let’s keep on driving change for better cities! In Focus is an initiative led by Bilbao City Council and developed under the umbrella of URBACT III, a European Territorial Cooperation Programme financed by the European Union via the European Regional Development Fund (ERDF). Alongside Bilbao, Frankfurt (Germany), Bucharest (Romania), Bordeaux and Grenoble (France), Turin (Italy), Porto (Portugal), Ostrava (Czech Republic), Bielsko-Biala (Poland), and Plasencia (Spain), are also participating.